Marches Centre of Manufacturing and Technology (MCMT) is urging young people interested in a career in automotive or motorsport to visit Loton Park over the Easter weekend (16th-17th) as part of its headline sponsorship of the Speed Hill Climb. The new £3m state-of-the-art training hub, led by a consortium of Classic Motor Cars, Grainger & Worrall, In-Comm Training and Salop Design & Engineering, believes the two-day event is the perfect opportunity to promote a career in apprenticeships alongside the alluring noises and smells of some fantastic motor cars speeding up the Shropshire countryside. Bosses will be on hand to talk to individuals and their parents about their vision to create ‘2020 learning opportunities between now and 2020’ and how vocational learning can be a great way to forge a career and even study towards a degree…all without the massive debt of going to University. They will also showcase plans for the 36,000 sq ft centre in Bridgnorth, which will house dedicated fabrication, foundry, lathe, metrology, milling, robotics and vehicle trimming sections, as well as a specialist CNC Zone and spray booth/mixing capabilities. 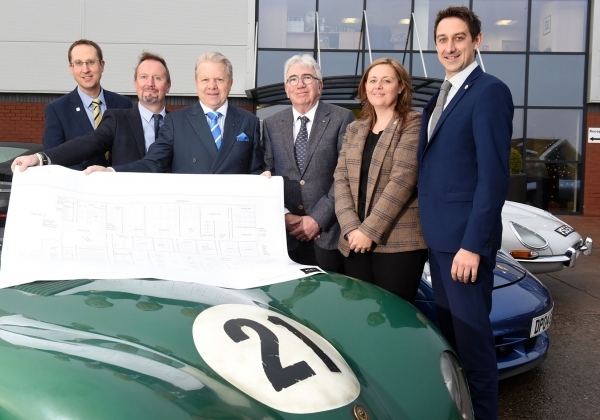 “The Loton Park Speed Hill Climb is a fantastic event for anyone interested in cars, nostalgia and competitive racing, which is why we thought it would be a great opportunity to raise the centre’s profile and get out there in the community,” explained Chris Greenough, Commercial Director for Salop Design & Engineering. He continued: “They get to see some amazing cars, including classics such as the Sierra Cosworth and Peugeot 205GTI, through to the Subaru WRX, lightweight racers and specialist F1 style hill climbers. We can talk to them about how they could potentially be going into a job which sees them working on vehicles or in the supply chain. “The MCMT, which is funded by the Marches LEP, is a massive opportunity for the area, but we do need businesses, parents, schools and young people to play their part, starting by filling our first cohort of 40 places for this September. The Loton Park Speed Hill Climb course is 1475 yards long with an average gradient of 1 in 25 (4%) and the steepest of 1 in 7 (14%) and is rated as one of the country’s most demanding hills by competitors. Now Run by the Hagley & District Light Car Club, the track was originally constructed by the members of The Severn Valley Motor Club based in Shrewsbury, in the mid 1950s. For further information on MCMT visit www.mcmt.co.uk or visit them in the paddock at the Loton Park Speed Hill Climb.